Same menu; fresh juices and smoothies made with real fruits/vegetables. We have dairy-free bubble tea, organic/fair trade coffee provided by “Grounds for Change,” locally roasted in Poulsbo, which I pair with organic milks only. My dad’s anise/almond biscottis will still be stocked. Bagel sandwiches made with Einstein Brothers bagels, and smoothie bowls topped off with superfoods like cacao nibs, chia seeds, spirulina, granola, etc. One of my goals has been to serve healthy food with great ingredients to my community; Unwind Cafe is my opportunity to do that. And to top it off, we have a great view of the Seattle skyline. … It’s a great place to come and unwind. Vanessa expects to reopen the shop this Friday. Laurel here, owner of Ounces! Hoping you’ll join me and our brewery friends to help raise money for a cause very personal to me. I was recently diagnosed with a brain tumor and will be going under the knife (hence the name, lol) on April 3rd to have it removed. Before the surgery, I’d love for you to come have beer/cider with me and help raise a bunch of money for brain tumor research! Here’s how the fundraiser works: We’ve partnered with 21 of our brewery friends (and 2 cideries) to raise funds for the American Brain Tumor Association (or ABTA). For 1 night only, both us and the 23 breweries/cideries will be tapping up a specific beer/cider and donating $1 of every pint sold (us at Ounces and each of the breweries/cideries at their respective taprooms). So on Thursday, 3/28… head to Ounces or one of the below breweries and lets all drink beer for a good cause! Laurel and husband Andrew Trujillo opened Ounces in North Delridge (3809 Delridge Way SW) in 2016. For more info on the participating breweries, follow the links in this post on the Washington Beer Blog. As announced a month and a half ago, Friday (March 8th) is the big night for The Best of Hands Brewery and Barrelhouse (7500 35th SW) – its grand opening! The proprietors took a break from intensive preparations to invite media in tonight, so we stopped by for photos. Above are Chris Richardson, Gregory Marlor, and Nicholas Marianetti. They’ll have 17 beers on tap when they open – 12 ar theirs. Best of Hands is not a restaurant, but food trucks will be visiting – Falafel Salam this Friday, Buddha Bruddah on Saturday, Plum Bistro on Sunday. Best of Hands is a 21+ space; hours will be 3 to 10 pm, Thursdays through Mondays. P.S. If you’re wondering about the rooftop cow, inherited from the space’s previous tenant John’s Corner Deli – it’s not back in place yet, but, the proprietors tell us, soon! ADDED TUESDAY: The cow’s return turned out to be REALLY soon – hours later! Actually the production company we are working with is based in Seattle and were able to source locations in their area for our commercial. They will be coming down here tomorrow to finish up the non-grocery store portion at our corporate offices in San Francisco. I hope your readers will enjoy spotting their favorite store when the ad runs…they will have the inside scoop. Craft beer drinkers near and far – rejoice! Best of Hands Barrelhouse, West Seattle’s newest microbrewery, will open March 8, 2019. Casual imbibers to beer connoisseurs can look forward to a comfortable taproom and outdoor patio to discover beer designed around Washington state ingredients and terroir. -Lastly, the parking lot on 35th beside the patio, as well as Clearview’s parking lot, will be available to our guests after 5 pm on weekdays and anytime Saturday and Sunday. There is usually ample street parking besides, and we’re conveniently located on the 21 bus line. As for the cow (whose name is Merriam), Nick says she will be back before they open. My desire to start a coffee shop in West Seattle began when I was 18 and I started working at Uptown Espresso on SW Edmunds St. I have continued to fall in love with the community of West Seattle as I made my residence permanent a few years back and juggled four jobs, two of which allowed me even more exposure to the best of the West; Ma’ono and Uptown Espresso. I am beyond excited to create a space where every person that walks in the door feels like they can be unabashedly themselves and leaves at least a bit better off than when they entered; satiated mentally, physically, and emotionally. My shop is centered on building the beautiful community of Delridge and bringing together people from every walk of life through interpersonal communication and connection. I’m partnering with Victrola for my beans. I grew up on Cap Hill, going to their original shop on 15th; it’s where I began my love affair with coffee and I still think they make the best coffee in Seattle. They also have one of the most supportive, intelligent, ethical, and just generally wonderful team of coffee professionals. I’m also featuring Friday Afternoon Teas. Friday, the owner of the tea company, is a true tea artist and scientist. Her teas are unlike anything I’ve ever tasted or smelled. She uses a combination of ethically sourced fruit, herbs, and spices to create unique and intoxicating blends. Lastly, I serve pastries from my innovative and mastermind bakers down at Macrina. They deliver tantalizing treats daily for the fantastic folks of West Seattle to snack on with their craft coffee. Youngstown Coffee Co.’s hours are 5 am-6 pm weekdays, 7 am-3 pm Saturdays and Sundays. Four and a half months after the sudden death of Uptown Espresso‘s owner, the local chain is getting some management help – and some resulting changes have raised questions among customers. 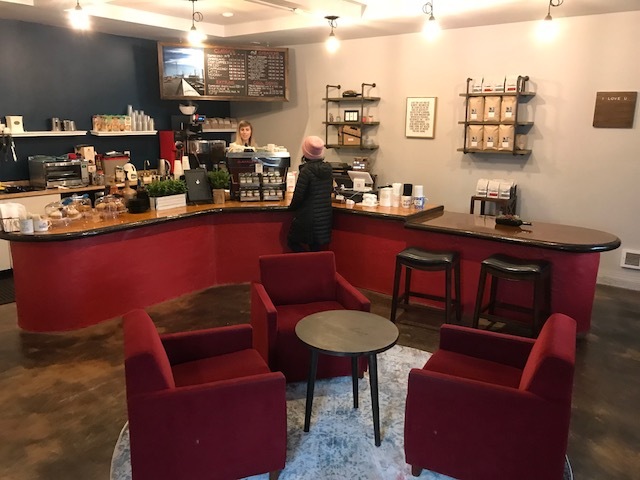 We looked into the changes – specifically, the ones made at the Uptown shops in the West Seattle Junction and Delridge – after e-mails from half a dozen customers wondering about the changes and rumors of others to come. The major changes confirmed by the new management: The Junction shop is now closing earlier in the evening. And the Delridge shop is phasing out retail sales of board games. Uptown owner Dow Lucurell died in July, just 54 years old. Fonté Coffee, Uptown’s roaster, is now its manager. The West Seattle Junction store, however, is closing earlier, at least for now, Cronk confirms. Previously, it was open until 10 pm five nights a week, 11 pm Fridays and Saturdays, and now it’s closing at 6 pm, seven nights a week, displacing some community groups that had held evening meetings there. West Seattleites Kendall Jones and Kim Sharpe Jones founded the Beer Church with the idea they could do good deeds while having a good time. Twenty years ago, they organized the first beer-and-bowling event they called the Turkey Bowl. Though Kendall at first wasn’t sure there’d be a second Turkey Bowl, it rolled on and gathered momentum year by year, and around the 10th one, he says (that’s the first one we covered), they realized they had a good thing going. How good? Tonight’s Turkey Bowl also launched this year’s Beer Church IPA, a partnership with three breweries, with sales benefiting the Crohn’s and Colitis Foundation of America. You can “look for it at better beer bars and bottleshops around the Seattle area” even if you didn’t make it to tonight’s Turkey Bowl. P.S. Kendall and Kim also bring you the Washington Beer Blog year-round. Located in the heart of SODO, just a 10-minute drive from West Seattle, Schooner Brewing is a neighborhood brewery serving up delicious hand-crafted beers! Most of the staff call West Seattle home, and the brewery has a long history of involvement in the West Seattle community. Independently owned and operated for over 11 years, Schooner Brewing offers everything from classic Northwest IPA’s and Lagers, to Barrel-Aged Sours and Farmhouse Ales. House favorites include Hopvine IPA, 3 Grid IPA, King Street Brown Ale, and SODO Lager. Longtime head brewer Joel Stickney enjoys experimenting with different hops and barrel-aged sours to consistently offer new and unique options. Schooner’s commitment to the craft is unwavering, and guests can taste the time and energy that goes in to every pint. The tap list features 20+ options ranging from Schooner beers, draft Washington wines, house-brewed spiked seltzers from San Juan Seltzers, and Timber City Ginger Beer, a non-alcoholic beverage made in the South Park neighborhood. The dinner menu showcases a variety of large plates and shareable appetizers such as Chicken and Turkey Bahn Meatballs, Beer Cheese Dip with Giant Soft Pretzel, Chicken & Waffle Sandwich, The Schooner Burger, Asian Noodle Salad, a Build-Your-Own Dirty Fries menu, plus a variety of seasonal dishes highlighting fresh, in-season produce. Dinner and snacks are available in the brewery from 3 p.m. to close daily. Happy hour is offered Monday-Friday 3-5 p.m. and features $3 select pints and $2.50 King Street Brown Ribs. Schooner Brewing’s weekend brunch is served Saturday-Sunday 10 a.m.-3 p.m. and offers dishes such as Biscuits and Gravy, Chicken and Waffles, Fresh Veggie Scramble, and Seasonal Pastries. Schooner Provisions, the adjacent lunch deli, offers hot and cold made-to-order sandwiches, fresh salads, fish and chips and more, Monday-Friday 10 a.m.-3 p.m.
Schooner Brewing and Provisions is located at 3901 1st Avenue South. Schooner Provisions is open Monday-Friday 10 a.m.-3 p.m. The brewery is open Monday-Thursday 3-9 p.m., Friday 3-10 p.m., Saturday 10 a.m.-10 p.m. and Sunday 10 a.m.-9 p.m. Weekend brunch is served Saturday-Sunday 10 a.m.-3 p.m. Happy hour is Monday-Friday 3-5 p.m. To learn more, visit www.schoonerbrewingseattle.com or call 206-432-9734. We thank Schooner Brewing and Provisions for sponsoring independent, community-collaborative neighborhood news via WSB; find our current sponsor team listed in directory format here, and find info on joining the team by going here. Three months ago, we mentioned that a coffee shop to be called West Seattle Grounds was on the way to the former mortgage-broker space at 2141 California SW, next to Mioposto. Now it’s open (thanks to Adam for the tip). West Seattle Grounds is serving Caffe Umbria coffee, along with baked goods, breakfast and lunch sandwiches, and salads. Hours are 5:30 am-8 pm Mondays-Saturdays, 6:30 am-8 pm Sundays. P.S. As posted in our West Seattle Jobs Offered section, they’re hiring! 6:38 PM: Perfect night for a Wine Walk … second one this year presented by the West Seattle Junction Association, and another sold-out event. More than a dozen Junction businesses are hosting wineries; the WSJA photo above is from CAPERS, where Viscon Cellars (WSB sponsor) is pouring. (Our other winery sponsor, Welcome Road, is featured too, pouring tonight at Carmilia’s boutique.) Here’s the full lineup. Watch for word of more Wine Walk action next year, and remember to get your ticket(s) early! To participate, the Pupstomer must be in costume at the shop within the month of October. Each Dogstume (dog in costume) will be photographed at Dutchboy Coffee and will be judged on originality, quality, and pizazz. All pupstomers’ pics will be on Instagram for all to vote. Jenni adds that there are prizes: “A fancy custom dog collar made by local artist Angelia, a drink for the human, and a picture of the lucky dog in costume on our wall for all to see.” Judging will happen on Halloween, and the winner will be announced November 1st. Dutchboy is on the southeast corner of 16th SW/SW Holden. Having a Halloween/harvest contest, event, etc.? Let us know – for our calendar and our annual Halloween Etc. event guide, launching soon – westseattleblog@gmail.com – thank you! Thanks to Evan for the tip via Twitter – another West Seattle business closure, The Daily Dose coffee shop (5214 Delridge Way SW). We don’t know when it happened, but Evan was the first to mention it to us, after spotting that sign in the window this morning, and we went over to confirm. The first-ever West Seattle Beer and Music Festival has begun! The boards up outside the Alki Masonic Center in The Junction tell you what’s happening – including the featured restaurants and breweries. From left are Chris, Allison, and Morgan. The festival’s on until 10 pm; part of the proceeds benefit WestSide Baby. The Masonic Center is at 4736 40th SW, and you can get your tickets – which include food and drink – here. Tomorrow has two sessions, afternoon and evening, and then the festival finale is Sunday afternoon, when you’re invited to bring your pup. ELECTION DAY! Get your ballot into a mailbox today (postage no longer needed) or into a King County Elections dropbox by 8 pm tonight – West Seattle’s dropbox is by the High Point Library (3411 SW Raymond). Here’s our most-recent election refresher. WADING POOLS: Could get to 90 today, so they’re open. West Seattle’s Tuesday pools are Lincoln Park (8011 Fauntleroy Way SW), 11 am-8 pm, and Delridge (Genesee/Delridge), noon-6:30 pm. ‘NIGHT OUT’ BLOCK/BUILDING PARTIES: Tonight’s the night that neighbors gather to build and celebrate community in the spirit of safety. 6-9 pm is the basic window. West Seattle has more than 260 registered block parties that’ll be closing off side streets; some have also chosen to be shown on this map. SEE THE FUTURE … by browsing our complete calendar. It’s a benefit, too, with ticket proceeds helping WestSide Baby serve thousands of families in need. So far, 30 local and national brewers are participating in the West Seattle Beer & Music Festival, with 70 beers, both specialty and familiar. The spirits will be offered in handcrafted cocktails in a special lounge. And the food pairings will be featured in “Sips and Bites” popups “curated by local culinary stars working directly with festival brew masters.” Food on Sunday will include a pig roast, and that’s also Dog Day – when you’ll be able to bring your furry friend. As for the music – showcased acts include Rippin’ Chicken, Funky 2 Death, Marmalades, and Unsinkable Heavies – plus others – as well as DJ Indica Jones. READY TO GET YOUR TICKET(S)? There’s a range of festival ticket options, starting at $25. All include a souvenir pint glass, available for pickup at the festival. Limited and VIP ticket offerings are available, with amenities listed by organizers as including “early access, preferred seating, special drinks, private restrooms, custom T-shirts, private pours, and epicurean creations.” Get your ticket(s) here! West 5: Welcoming a new WSB sponsor! 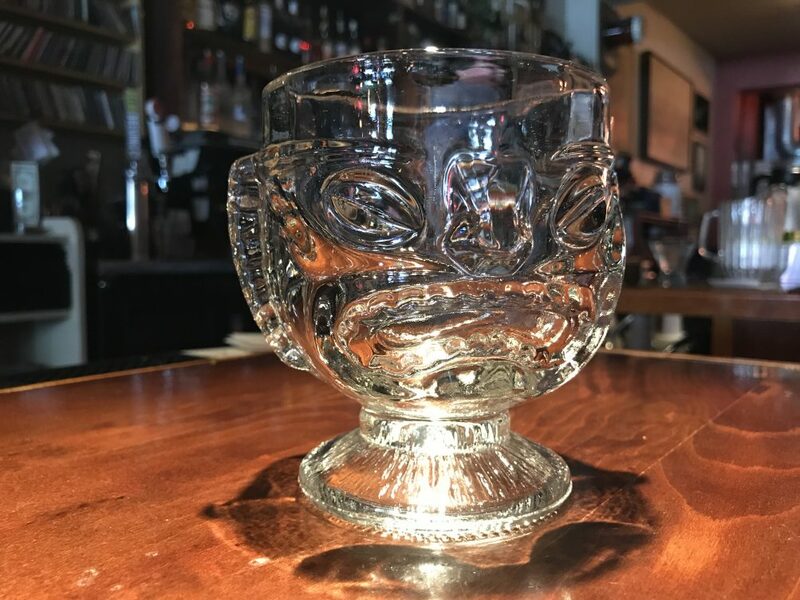 You probably recognize this now-iconic mug – known best to hold the Mai Tai at West 5. The West Seattle Junction restaurant/bar is one of our newest WSB sponsors, and we’re officially welcoming them in this week when we all celebrate what’s local as Summer Fest approaches. This is a big year for West 5, celebrating its 15th anniversary in the spring. Co-proprietor Dean Overton explains that the idea of opening a place grew out of the closure of the old Admiral Benbow. He and business partner Dave Montoure thought that the neighborhood needed a good bar that kept the spirit and flavor of the neighborhood alive. Since Dean and Dave are both West Seattle born and raised, they thought they were suited to bring that idea to life. 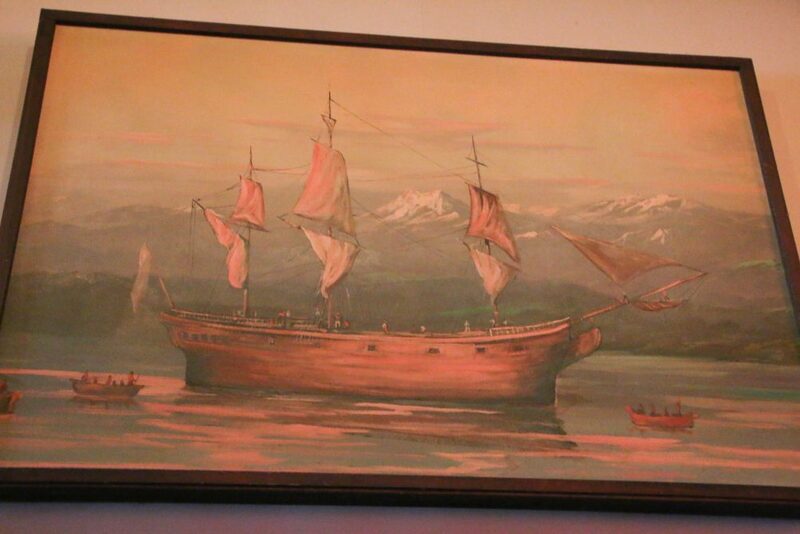 Once they secured West 5‘s location in the Junction, Dave and Dean stocked the place with items from some of the other former West Seattle establishments, such as the giant plaster ship painting, which came from the old Vann’s (now the Maha). 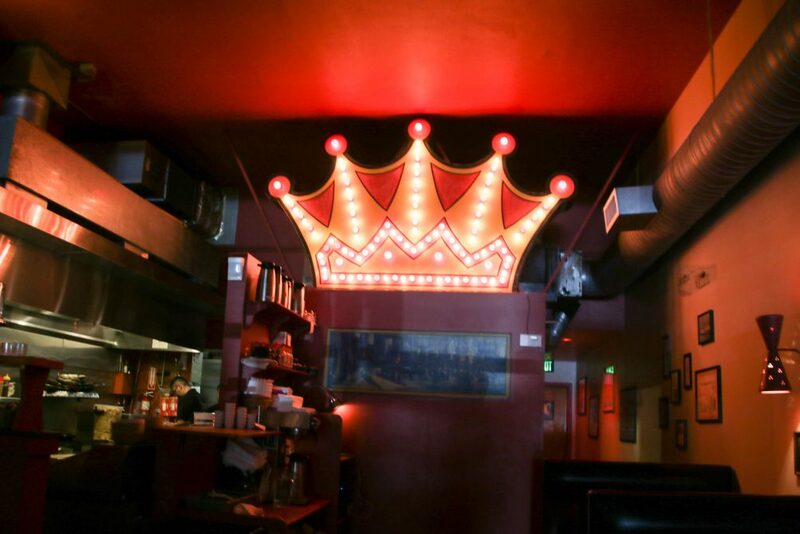 West 5‘s signature lighted crown in the rear of the restaurant came from the time when the space was a bowling alley. Looking back, Dean says he and Dave were ahead of the curve in trying to bring a great establishment to the Junction. (One that happens to be TV-free!) Over time, they believe that they’ve been around this long because they let the community have a say in which direction West 5 would take. While that’s meant some changes to the menu – don’t worry, some faves like the legendary mac and cheese are still there! – and drinks, it also creates a sense of togetherness for both the patrons and staff. As always, West 5 will have its outdoor café for Summer Fest next weekend, starting Thursday night with the Yadda Yadda Blues Band. But you are welcome to visit any time of year – 4539 California SW – lunch, dinner, drinks, and/or weekend brunch. We thank West 5 for sponsoring independent, community-collaborative neighborhood news via WSB; find our current sponsor team listed in directory format here, and find info on joining the team by going here. The mortgage broker who originally was in the space has moved to Sunrise Heights. Documents on file with the city say the coffee shop for which the space is now being renovated will be called West Seattle Grounds. We have a message out in hopes of finding out more. The South Delridge area will see the arrival of a new neighborhood bar and restaurant later this summer, with Can Bar set to sail into the stretch of 17th Avenue SW between Delridge and Roxbury. David Gradwohl says he and his partners — Josh Baymiller and James Imonti — are hoping for a mid-July open of their nautically themed bar and restaurant, with an eye toward being able to meet the community during White Center Jubilee Days (July 18-22). The “Can” in Can Bar is a reference to the prominent role canned beer will play in the bar’s offerings. While there will be six taps for draft beer and a full bar, there will be no bottled beer available. Soon to join the West Seattle bar scene: The Alley. Jade Nguyen explains that her parents – who have operated Be’s Restaurant in The Junction for more than 30 years – wanted to open a bar. The private room in the rear of the restaurant at 4509 California SW, which hadn’t undergone much updating over the years, seemed like the perfect space. So it’s undergone a transformation in recent months – with Jade teaming with veteran local bar specialist Tony Larson to create a space with a “speakeasy” motif. We talked there with Jade and Tony earlier this week. The lighting will be dim; the decor and cocktails will transport you back in time to the Prohibition-era. Even the bartenders/servers’ uniforms and chilled glassware will be intended to enhance the mood. Tony says he is “huge on bars as a place for people to talk, to put your phone down.” The Alley will be that kind of place. You’ll enter from the alley, one door down from California/Oregon. There might not even be signage. Probably just a light to let you know you’re in the right place. Most of the drinks will be familiar: “a decent-sized menu, about two dozen cocktails, you’ll recognize most of them.” Manhattans, for example. And Sazeracs. And some “new classics,” promises Tony, who will do some bartending in the early going too (you might know him from the launch team at Alchemy [WSB sponsor]). Music? Jazz, says Jade, who has also been working on the decor – The Alley’s somewhat industrial-looking legacy windows will be covered by velvet drapes; a crystal chandelier catches your eye over the corner “lounge” area on one end of the bar. Other touches include an antique fireplace grate and some wall bricks that are newly installed but look like they’ve long been in place. Food? Small bites. And before too long, you’ll be able to dine next door, as Jade says she expects to expand Be’s dinner offerings into later hours once the bar’s open – Vietnamese food, in particular (she’s working on a new menu for that). Hours for The Alley will be 4 pm to midnight Sundays-Thursdays, 4 pm-2 am Fridays and Saturdays. Happy hour 4 pm-6 pm. They expect to be open by West Seattle Summer Fest Eve (July 12th). The Westy was on the event’s lineup card too! We’ll be following up with the Helpline for the Taste tally tomorrow.